As has become traditional we have a part-Christmas concert. It covers all the bases, since if you enjoy Christmas you’ll like the second half and if you’re yearning for a heatwave there’s plenty of non-Christmas in the first half. There are pieces old and new, simple and complex, easy and difficult. 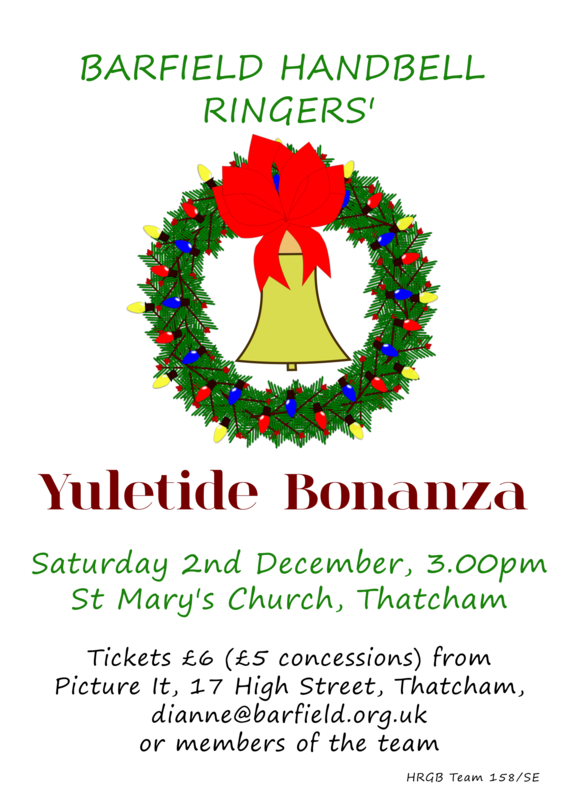 So to be eased gently into the festive season, or to provide an excuse for putting off the shopping for another week, come and hear us at St Mary’s Church, Thatcham on the 1st of December, 3.00pm! Preparations are well under way for our next concert, which is on the 19th of May at 7.30pm. Now you may think this date sounds familiar… and it is, for it happens to be the day of the Royal Wedding! So we are all doing our best not to make puns on “ring”, and hoping some people will not be too exhausted by the celebrations to come and hear some bells. Thanks to the people at Where Can We Go for including the concert on their website. New Christmas music. We’ve got three new pieces to practise, and two of them are both playable and pleasant. As to the other….perhaps “trepidatious” would be more the word than “excited”. Saturday 9 December – Christmas Market at Milestones Museum, Basingstoke. Our small ensemble of 6 ringers will play festive music at intervals during the afternoon as part of the programme of entertainment. Sunday 10 December – Civic Carol Service, 4pm at St Mary’s Church, Thatcham. Everyone welcome. We will play during the service and also for 20 minutes or so beforehand as people arrive. Yes, that’s what our next concert is called. If ‎you would like to hear a Bell Boogie, meet a magic dragon or see us attempt a bassline that is highly mischievous, then come along ‎to Ashford Hill this Saturday. Mid-May Music and Mischief, St. Paul’s Church, Ashford Hill, RG19 8AZ. Saturday 20th May, 7.00. Tickets £7.50, children free. To reserve tickets phone 01635 299227. Who’s got a talented beginners’ team, then? Well, we have! Our five recruits have come on wonderfully since they started in September. When they started we thought they’d just about manage to learn a couple of pieces by December. Then we thought it would be nice if they played a piece at the beginning of the Civic Service. As it turns out they played six carols and relegated the senior team to the middle of the service! We’re really impressed with the way they’ve progressed. So to the one who insisted on playing Belleplates, the one who made more noise with a stool than with bells, the one who wanted the bells turned down, the one who’d never read music before, the one who couldn’t start until they did their homework, and the one who told the joke about the cats swimming the Channel, our heartiest congratulations… and see you in the New Year! 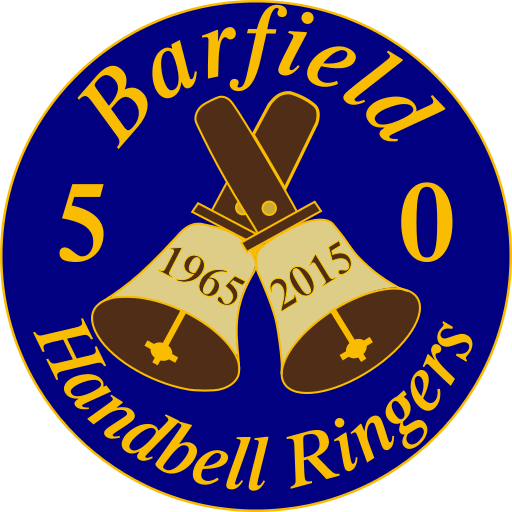 2015 was a special year for Barfield Handbell Ringers as they celebrated the 50th birthday of the group. 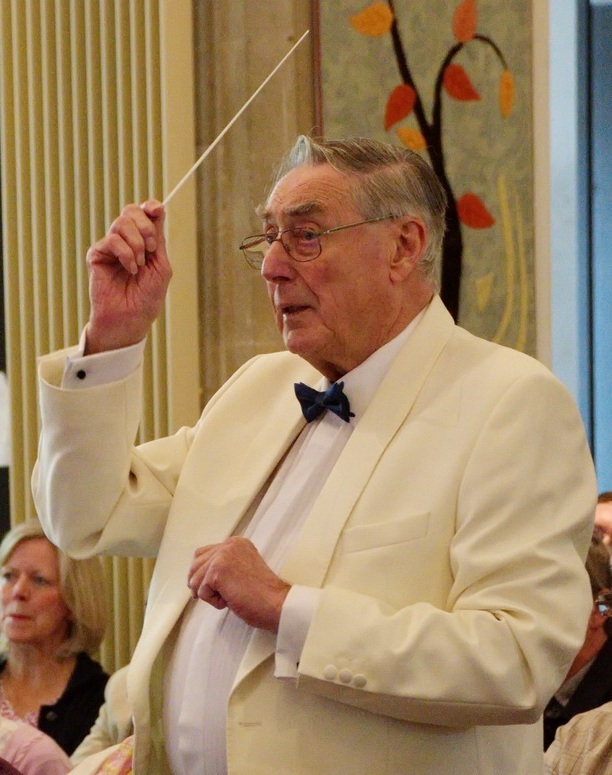 Bill Butler started the group based in Thatcham, built it up and has remained its Musical Director until he decided to retire at Christmas 2015. The group organised and performed in various events in their 50th year. June saw a full school hall in Newbury for an HRGB SouthEast Region rally attended by 18 teams. Tables and teams were decorated with gold and we had an enjoyable day’s ringing with, needless to day, a good supply of cakes. 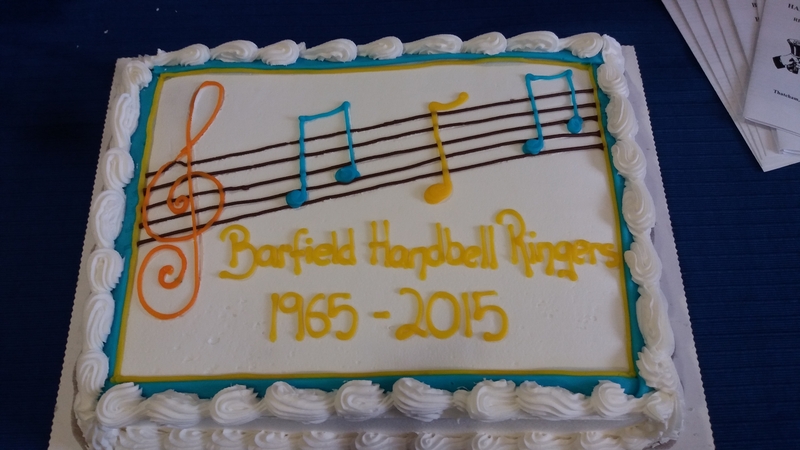 In September we held our memorable Golden Anniversary Concert with music specially chosen by Bill. 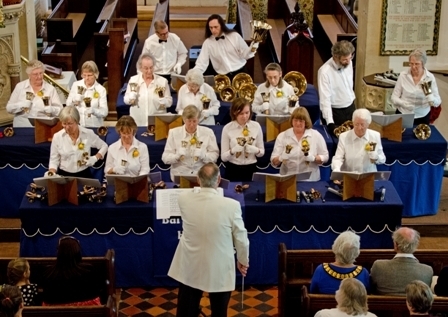 Some is part of the group’s history (Bill’s arrangement of Whistling Rufus and Sandra Winter’s specially written Call of the Bells). Other pieces are favourites; Blessed Assurance and God’s Train .The pieces chosen for the concert show the breadth of music which Bill conducts and performs. Several handbell ringers in the audience said that it was good to hear some tunes they had not heard played recently. We were pleased to see so many relatives, friends and colleagues from both the handbell and tower ringing communities. Bill has taught many ringers of both types over the years and has helped teams to start up successfully. At January 2016’s AGM the team presented Bill with a gift of an engraved glass, to say thank you for all his hard work and for the enjoyment he has given to many people by his musical activities Although Bill is no longer the team’s Musical Director he is still a valued member of the team. Have you ever heard handbells being played and thought you would like to try this lovely activity? Or perhaps you have never heard handbells and would like the opportunity to hear and try them for yourself. If so, we have the answer: a new handbell team for beginners.